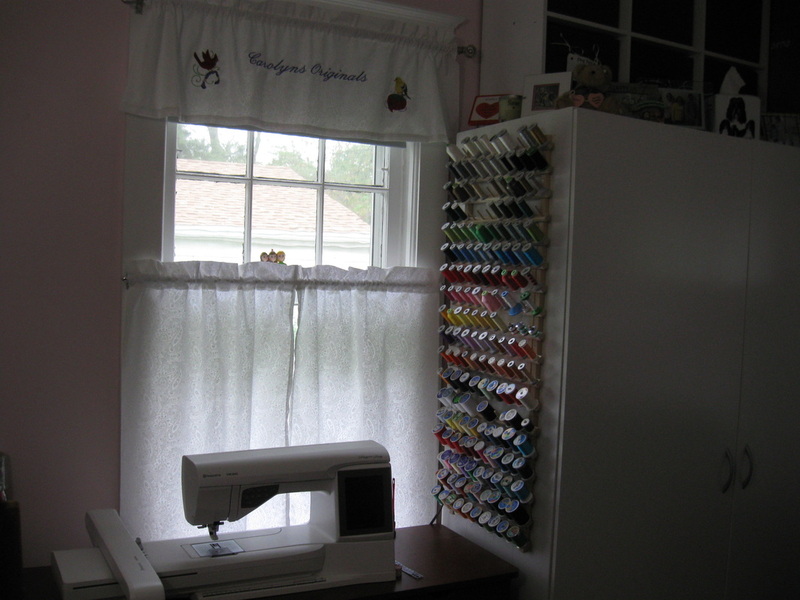 I have been sewing for approximately 40 years. 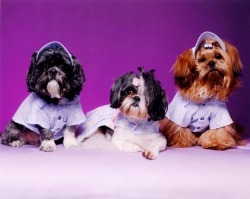 I began sewing dog fashions for my 2 Shih Tzu's, Tasha & Cy when I began taking them to the local hospital and nursing homes as therapy dogs. The patients always enjoyed seeing them in their outfits. I have since added a third Tzu to our family CT who I keep in long coat. 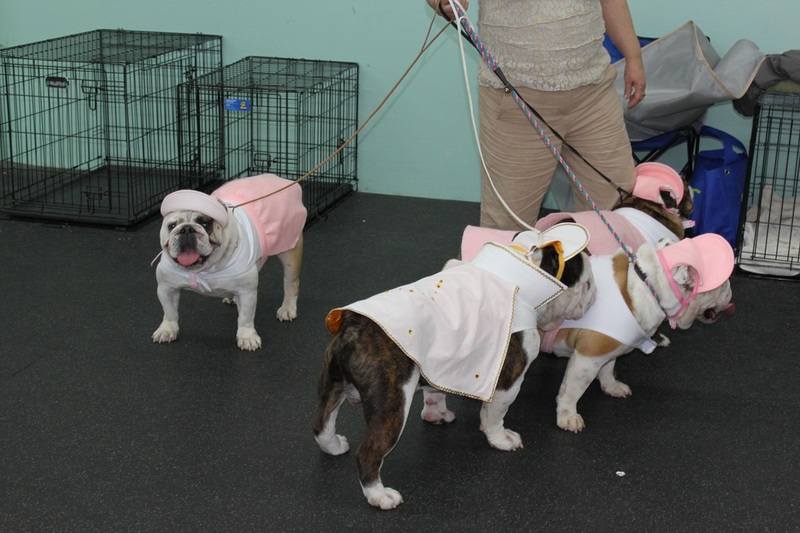 So inspired by my wonderful doggies and encouraged by my friends, I sew comfortable, wearable, fashion-forward pet clothing in my home studio. All items, made in the USA, are supervised by "Shih Tzu quality control." All my clothing is sewn by me personally. I only make a limited number of items from each fabric. I prefer to keep items limited so your dog is wearing a unique item. I will update with new pictures as items become available. Please browse through the pages by clicking on the heading you would like to view (above this box in the gray border). To enlarge the photo with the item description just click on the photo. endless enthusiasm for dressing up. put herself right in front of them. glory. Any outing was Tasha's photo opportunity, as she saw it. for so much longer. It's never long enough, but my darling, precious Tasha will prance in my heart forever. Carolyn's Original Models: Thank you to each and every one! Here are some photos of a custom order for a 50's theme party, what adorable English Bulldogs! You can create a custom order by emailing me. 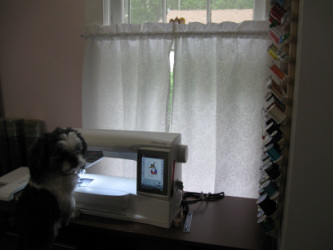 Here is Tasha watching to be sure the design I am sewing gets a 4 Paw approval from the Tzu quality control team. Please feel free to email me with any questions at: Carolyn's Originals. If you would like to be notified when new items are added to the site please email me and I will add you to my email list. Your email address will not be used for any other purpose. Don't see what your looking for or you have some fabric you'd like something made from. 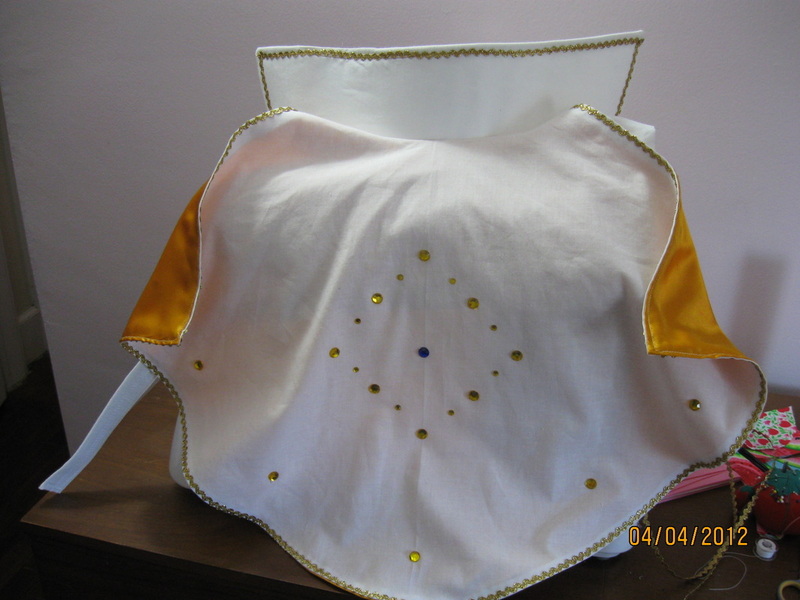 Please email me and I will be glad to work with you on a custom order. If your dog needs a special size I can do that. I do prefer to stick to styles you see listed but am willing to work with any size or fabric for these styles. Email me at Carolyn's Originals. I will return your email as soon as I can, I may be busy sewing and not checking the computer so please don't think I won't answer and if you don't hear back from me please send a second email just in case the first one didn't come through. All items have free shipping. If you purchase 5 items or more your items will be shipped by Priority Mail. Less than 5 items will be shipped First Class Mail. I accept PayPal. You will automatically be taken to the PayPal site to pay for your items. If you prefer to mail me your payment please email me at: Carolyn's Originals and I will send you an invoice and mailing information. If you are not happy with an item or it does not fit your dog you must send me an email within 10 days of the date your order was shipped. I will refund your money when I receive the item back from you or I will gladly exchange it for another item of equal value. I want you and your dog to be happy with your order. Customer must pay shipping to return item to me, I will then pay shipping to ship item back to you if it is an exchange. Carolyn, Raja loves everything you have made for him! Great designs, so comfortable, durable, made with kindness and love! Carolyn's Originals are the best!! She is very creative. The dog beds are so warm and cozy. I have washed mine many, many times and it still looks like new! Thanks Carolyn for doing such a great job!! Carolyn's Originals are simply fabulous. I have gotten shirts, dresses, pajamas and t-shirts from her. Everything is so well made and is made to my shih tzus measurements. I have all different size babies and they were hard to fit and dress them a like. I don't have that problem any more. I am a repeat customer and will continue to purchase from Carolyn's Originals. Carolyn's new tee shirt line has taken off like a rocket ship! We've ordered several and find it is so much fun to pick out designs and sayings that fit each pup! The shirts are lovely, light weight, and so well done! The craftmanship is incredible, but that's what makes Carolyn's Originals such fine clothing! I put several pix of my two in different tees on my FaceBook page! Keep up the great work, Carolyn! Carolyn, Your site is looking so wonderful... the models are just precious! Just want to say that your clothes' quality is through the roof! How DO you do it? Also, I love the charming names for each outfit. 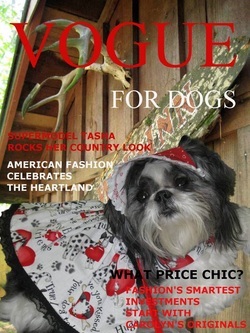 Carolyn has been dressing my tiny tzus for almost a year. Each and every item is absolutely beautiful and meticulously crafted. When they wear their Carolyn Originals, they step out in style and are sure to get many compliments. I couldn't be more pleased with their beauty or the workmanship. It is obvious that they are lovingly made and Lexie, Angel and Abby reap the benefits. thank you so much, Carolyn. The quality of the workmanship of Carolyn's Originals is simply outstanding. Everything is thoughtfully made for comfort and fit, and each piece is so well constructed it will be enjoyed for years and years to come. Carolyn's customer service is OUTSTANDING! Want something you don't see? No problem! Carolyn will work with you to create what you are looking for. Shipping is always prompt and each item is protected so they are not damaged in transit. I HIGHLY recommend Carolyn's Originals; you will not be disappointed with the quality of her products, the fit, or the service. My "girls" enjoy being the best dressed in town thanks to Carolyn's beautiful creations. We can't wait to see what she comes up with next! 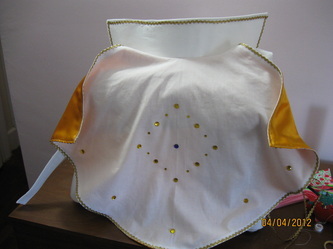 The clothes are sewn well and look terrific — I should mention that the dog dresses are reversible! That's right you actually get two dresses for the price of one. Carolyn takes real pride in making he customer happy. My male Maltese gets cold at night but finding a pair of doggy pajamas that fit him has proven to be impossible so Carolyn is working on making him a custom pair. I can't wait to see what she comes up with as I know it will be terrific. I am a very happy customer and I highly recommend Carolyn's Originals to all. Buttercup, being the Princess that she is, has been giving the gift of Carolyn's fine distinguished clothing, and sun visors! Each article is a work of fine detailing and love. The dresses are reversible, so you get two for the price of one! Every article is an original, you can special order, and you receive your order in a timely fashion! We highly recommend Carolyn's Originals to all our pals! Get in fashion with Carolyn! you don't want to be left out! Lovely website Carolyn! Just VERY cool in the way how you and Mom make all those things and make doggies and people over the entire world happy! Just keep going on the Great Work! 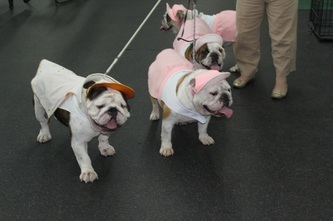 Hi Carolyn, I love the the Sailor Suits you made my boys Coco and Bandito. They both seem so proud when they wear them. I REALLY loved the pants too.. :-) They just look so adorable. Your items are made so well I can't wait to order some more. If you would like to contact me or leave a testimonial you may use this form.